In a letter to embattled Wells Fargo CEO John Stumpf, Sen. Patrick Leahy (D-Vt.) on Friday referred to allegedly fraudulent business practices at the bank as "outrageous." But Leahy does not appear outraged enough to return the $2,000 contribution he received from a Wells Fargo political action committee in September 2015, nor the $1,000 donation he received in May 2016. "Support for his campaign does not affect his policy decisions and never has," Leahy campaign spokesman Jay Tilton said Friday when asked whether the senator would return the money. "He does what he thinks is right for Vermonters, and [the letter] shows it." Asked again Friday whether that meant Leahy would keep the cash, Tilton said, "I'll let my earlier statement stand for itself." Earlier this month, Wells Fargo agreed to pay $185 million in fines after federal regulators accused the bank of fleecing its customers. According to the Consumer Financial Protection Bureau, Wells Fargo employees opened as many as 2 million unauthorized credit card and bank accounts in their customers' names over five years and charged millions in fees. In his letter to Stumpf, Leahy argued that "a major reason" Wells Fargo avoided detection for so long was that its customer contracts included a mandatory arbitration clause. That prevented customers from suing the bank in open court or joining together in a class action lawsuit. According to reports, some Wells Fargo clients attempted to sue as early as 2013. "If either of the lawsuits had been able to proceed in court, countless Wells Fargo customers might have been saved from being charged their hard-earned dollars for unauthorized accounts," Leahy wrote in the letter, which was signed by five other senators. "This forced arbitration system helps hide fraudulent schemes such as the sham accounts at Wells Fargo from the justice system, from the news media, and from the public eye. This is unacceptable." Leahy wrote that "one concrete step you can and should take to fix this issue and restore your customers' trust" would be to "immediately end Wells Fargo's use of mandatory arbitration clauses in your customer agreements." According to Tilton, Friday's letter was just the latest instance in which Leahy has spoken out against forced arbitration clauses. The senator has introduced legislation to ban the practice and held Senate Judiciary Committee hearings on the subject as early as 2007. "He has long led the effort to end corporations' practice of forcing arbitration clauses on consumers, the so-called 'rip-off clauses' that have become common over the last two decades," Tilton said. But the situation was also just the latest instance in which Leahy has declined to return campaign contributions from those who have engaged in suspect business practices. After Mylan came under criticism last month for drastically increasing the price of its EpiPens, Leahy's Republican opponent, Scott Milne, called on the incumbent to donate that company's campaign contributions to charity. 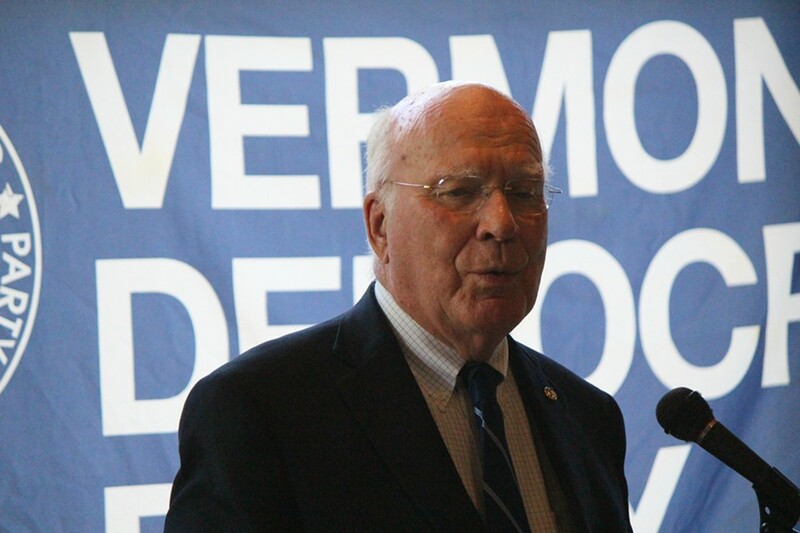 According to the Center for Responsive Politics, Leahy has accepted more than $20,000 in recent years from the drugmaker, which operates a manufacturing facility in St. Albans. "Sen. Leahy has criticized Mylan's pricing of the EpiPen and is currently helping to lead a bipartisan effort in the Senate to address this unconscionable price hike," Tilton said at the time. "Sen. Leahy will do what he has always done and report every penny that he raises and spends to run his campaign." Last April, after the Securities and Exchange Commission accused Northeast Kingdom developers Ariel Quiros and Bill Stenger of committing massive fraud, Leahy pledged to donate $5,800 he received from Stenger and his wife to charity. Last week, Leahy told VTDigger.org that he would "set aside" $5,000 worth of contributions he received in May 2014 from Charles Leamy, who worked with Stenger as general counsel at Jay Peak Resort. Leamy was named in a lawsuit filed by two Chinese citizens who were allegedly defrauded in the Northeast Kingdom scam, according to VTDigger. The plaintiffs dropped their suit on Friday. "I'll tell you what I'll do," Leahy told the online news outlet before the suit was dropped. "I don't know what might come of this court case, so I'm not going to interject myself on either side, but I'm going to go ahead and tell my committee to take [Leamy's] $5,000, set [it] aside and when the court case is done, if it looks like he was involved in something inappropriate, we'll just give the $5,000 to the Northeast Kingdom Fund. That's what I've done with the money Bill Stenger has given me."